What’s your best option for replacing missing teeth? It could be the dental implant in Indianapolis, a lifelike artificial tooth that resides in the jaw, bonding to bone for a strong foundation that lasts. Dr. Mark M. Farthing and Dr. Armin M. Tepner, cosmetic dentists in Indianapolis, place dental implants during a comfortable procedure in their Indianapolis office. Both members of the Implant Study Group, these skilled doctors see implants last for years. In fact, implants may be your final tooth replacements. What Could be Better than a Dental Implant? 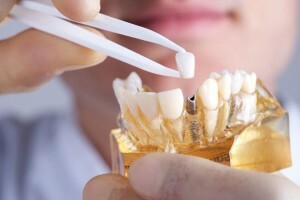 The answer is, only a natural tooth is better than a dental implant. Just as natural teeth anchor to the jaw bone with deep roots, so too, does the dental implant anchor to the bone with an artificial, titanium root resembling a screw. Unlike partial dentures and fixed bridges which best on the gums, the dental implant is inserted below the gum line. After Dr. Farthing or Dr. Tepner places the implant, it gradually bonds with the jawbone through what scientists call osseointegration. Osseointegration preserves the integrity of the bone, and in fact, keeps its natural size and density as the patient bites and chews on it. While healing takes several weeks after implant placement, the wait is worth it. After the dental implant site heals, the dentist attaches the metal abutment and porcelain crown. The finished product looks like a real tooth, feels like a real tooth and acts like a real tooth. Patients report that cannot tell the difference between their natural teeth and their implants. Your team at Indianapolis Family Dentistry recommends dental implants for patients who are in good overall health and who have enough bone to receive the device. Teens are encouraged to wait until they stop growing before they get dental implants. Plus, pregnant women should wait until after their babies are born before undergoing any elective dental procedures. While smoking does not disqualify a patient from getting dental implants, tobacco does threaten their success. Smokers can develop an infection called peri-implantitis from the toxins in cigarettes. So, tobacco users are encouraged to quit altogether or to abstain from smoking for 72 hours before and after implant placement. Research shows that dental implant procedures succeed more than 95 percent of the time, and those implants stay in place over 90 percent of the time. In fact, a dental implant may be the last tooth replacement a patient needs as most of these devices last for decades. Dr. Farthing and Dr. Tepner can answer all your questions about dental implants during a personal consultation. 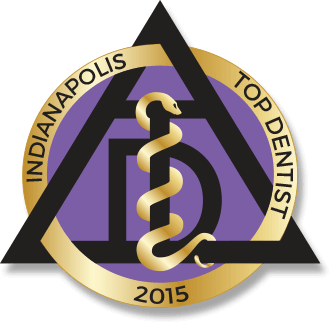 Why not contact Indianapolis Family Dentistry to set an appointment?